The Nord-Pas de Calais Mining Basin is a mining and industrial cultural landscape along a 120km long coal seam in the far north of France. It was created from the 18th to the 20th centuries, mostly after France lost its access to Belgian mines in 1815. It reached its peak in the 1930s, when it became one the leading coal-production regions in Europe. It then attracted 75,000 foreign workers. The last mine in the area closed in 1990. This is a serial site consisting of 109 parts, spread out over 13 mining company complexes. Elements include pits, slag heaps, railway stations and mining villages with schools, religious and community buildings. 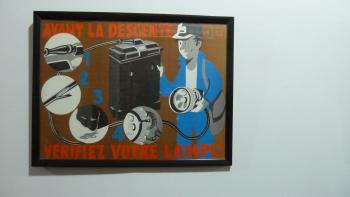 This is the French nomination for 2012: a stretch of 120km in the North of the country comprising various mining sites. When I was sent to attend a course at the Capgemini University just north of Paris, I thought it a fine opportunity to take this possible new WHS in on my way back home. I went to visit the Historic Mining Center in Lewarde, the main museum in the area. It is surprising how little in the surroundings reminds of the mining era. Nothing like the raw industrial beauty of the Ruhrgebiet just over the border in Germany. It just looks like a quiet rural setting. Coal was mined here from the 18th century til the 1970s. The harsh working and living conditions were immortalized in Emile Zola's Germinal, which happens to be one of my favourite 19th century novels. The mining center is pretty large and modern, though not yet well-equipped to receive visitors that do not speak French. Also, at the exhibitions I did not find anything that I had not seen before at similar sites around the world. It indeed is a big question what the OUV of this site is, and the short description at the Unesco website does not help to clarify it. What I've learned while researching it on the internet, is that this probably will be a serial nomination with single monuments scattered along the whole 1200 km2. It is marketed as an "evolved cultural landscape", as the mono-industry of coal mining has lastingly transformed the landscape and the lifestyles of the inhabitants. The slag heaps very visible when moving around in the Lens area gives a remaining memory. About 250 och around 350 made ones are left. There are som many aspects of this area as we can find belfries and WW1 memories everywhere. We come in contact with this WHS when visiting Louvre-Lens. This monumental new museum is built on the site of an old coal-mine. Some of it`s history shown in museum. Next to museum site is a complex of houses intended for miners who are inscribed in the WHS area and it is easy to stroll around in that area when having reached Louvre-Lens. Also the monumental destroying of the area in WW1 gives a backdrop for the need for Germany to pay a lot for that destruction in later agreements. Now is 100 years since WW1 ended and there are not many traces left of the war except the many monuments and graves that are kind of everywhere. Farmland is fixed but if you go up to Canadian memorial place Wimy outside of Lens, we can see fields that are left as they were 1918 and just natural erosion has tried to level out the ground in the battlezone. Perhaps this is not in the WHS but it is very much in this area and we really can't move much in this WHS before seeing some WW1 memorial. I generally agree with the review of NAN 2017, also why the Belgian mines are not in the same WHS, as with the belfries who are cross border. Coming in from Arras by train I immediately ticked off this site when I stepped off the train in Lens; the Gare de Lens is part of the inscription. From the station I headed into town and ticked of all locations in Lens. This included a World War 1 memorial for the fallen citizens, a unionist memorial, the historic union building, a worker housing district and the former headquarters of the mining company. Unfortunately, the signposting is lacking, so I found myself repeatedly wondering if I had found the site or not. After Lens I headed to Liberville to get a bit more of the industrial feeling of the site. From the train window several furnaces and mines could be seen, some of them part of the inscription. In Liberville I found myself lost again, wandering around a simple neighborhood and looking for the site and its OUV. I guess, the neighborhood itself was the site. The area wasn’t really touristy and the one furnace in town closed, so I decided to call it a day and head on to Lille by train. Looking back, I found Lens rather interesting and would recommend it as a good place to explore the site. There are no mines and furnaces in Lens, though. Instead this is where the workers lived. I guess they took the same train line I did to get to the work in the mines every day. The former wealth on display is impressive. When you stand in front of the headquarters of the mining company in a lavish park, you are more reminded of an absolutist palace than of an office building. Nowadays it houses a university and I assume during the week you would be able to enter it. In sum, the site tries to give a more complete picture of the life in the area in its industrialization heyday. I especially found the political aspects interesting and different from what I had seen before in the UK, Belgium or Germany. 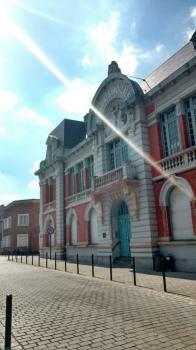 Also due to the area being a prime World War 1 battleground the area has many relatively modern buildings (post 1918). With the sheer amount of inscribed components it’s hard to really know how great the site really is. Of the locations I have seen, most were rather mediocre or underwhelming. I doubt this will ever be a popular tourist destination. Similar to other serial nominations I think this would have profited substantially by limiting itself to the best examples in the area and not the very generous approach chosen. Finally, it’s questionable, why this wasn’t combined with the nearby sites across the border in Belgium. The area has plenty of public transport options. The towns along the train line from Lens to Lille are more or less all part of the inscription. France being France you get great connections by TGV to everywhere else in France. Only challenge I faced where the frequency of trains over the weekend. Google maps holds all information you need. There are plenty of Belfries to see along the way. In Arras you will also find one of Vauban’s fortifications. A bit further South is Amiens Cathedral. Finally, you can always cross into WHS rich Belgium. Looking a bit into the future, the area is also dotted with WW1 memorial sites. Several WW1 memorial sites are already part of this inscription, but these are for the local French citizens defending their home country. For anyone travelling to Lens if you have some time, you can visit the local branch of the Louvre. You won’t the Mona Lisa, but the crowds should be way lesser. 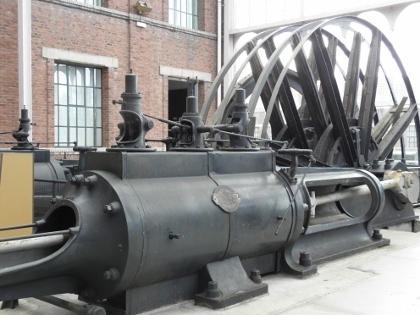 Several reviewers mention the mining museum in Lewarde. However, it does not seem part of the inscribed locations. If you want to go to a museum, one possibility is the mining and rail museum in Oignies (CMCF) near Liberville, which is a location of the site. Be advised that their opening hours are rather odd. Word of advice: Several of the locations shown on our map for Lens were off. Not by too much (200m max), but with proper signposting in short supply and the rather difficult to spot quality of the sites this was an issue. For Lens all locations are corrected now. I visited Chateau Hermitage, which used to be the manager's house of the mining company. 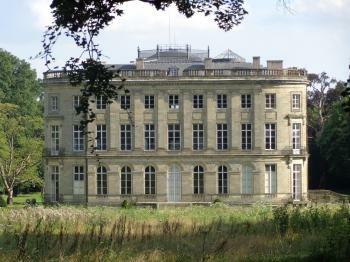 This Chateau is located inside the huge Park Hermitage, which is designed for hiking and biking today, and it was quite a nice hike in the afternoon I visited. Another day, another North Western European mining landscape to visit. And like the others here we headed to the mining museum at Lewarde. It was quite an enjoyable visit, helped by the wonderful late winter weather. The guided tour in French was complimented by an easy to use audio guide in other languages. The initial walk through the above ground processing plants was the most interesting. Then there was a walk through a mock mine housed in above ground tunnels. It was an interesting way of recreating the mining experience, of course it takes away many of the most disconcerting aspects of working underground, but then I guess almost all tours of European mines will do that. It did mean that the different mining technologies could be displayed next to each other to allow for comparison, and showed how technological advances improved life and safety in the mine. There was also a brief section on immigration from North Africa, which grew to staff the masses of mines in the area. The guided tour lasted a little longer than we planned, as such on finishing we had to rush off in a dash to catch our ferry. The rest of the landscape, scarred and sculpted through centuries of heavy industrial work, flew past quickly, but human activity is really evident. The towns seemed like many once great industrial areas that now seem sleepy and down at heel, having lost the central focus of their existence, hopefully some international recognition can bring economic benefits as well as boosting local pride. I appreciate this site being on the list, and the local community should be very proud to have their contribution to the industrial heritage of the world recognised. Having said that, it isn’t really something that would get me to come back and forgo the other treats of this area, such as Lille, and this is one of those WHS that I probably won’t spend much time reminiscing about in the future. I visited this WHS in February 2014 on a cold sunny day. I decided to "visit" a number of sites included in the buffer zone and marked on the official UNESCO website. After a few attempts that yielded nothing more interesting than a couple of mounds of earth, a few desolate brick houses, a small church near Aniche and a closed-down railway, I decided to drive straight to France's largest mining museum, the Nord-Pas de Calais Mining History Centre in Lewarde, which is actually a former coal mining plant where various trains, railways and rusty machinery can be seen. The visitor centre is quite interesting to visit although not as grandiose as the Ruhrgebiet in Germany. The information available near the 18 viewpoints across the mining site is only in French so an audioguide is necessary to be able to appreciate the history behind this place. Certain places are only accessible with a guided tour that takes around 1 hour (you have to wear a bright yellow helmet inside too!). 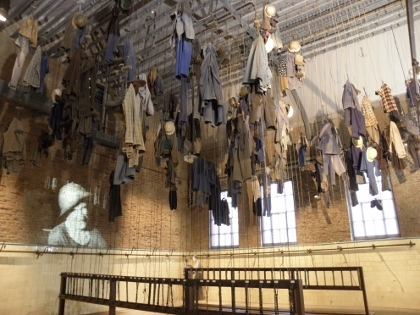 The highlight of my trip was the hanging clothes room where I could really appreciate how tough life must have been for coal miners. The museum is very expensive (14 euro or 12.50 euro) but at least there are all the facilities you could think of such as a restaurant, a cafeteria, toilets, a souvenir shop and also a pic-nic area outside. I would judge this WHS as France's least interesting. 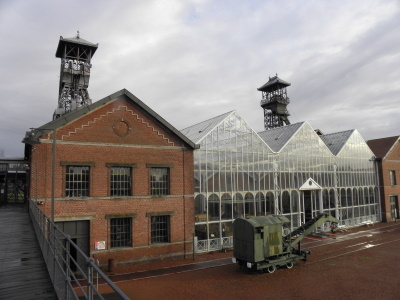 To be honest, I very much preferred other industrial heritage sites on the list such as Volklingen or the Ruhrgebiet in Germany, Salins-les-Bains in France, Crespi d'Adda in Italy, the Woudagemaal in the Netherlands or the nearby Wallonia mining sites in Belgium. As an Australian coal mining historian I attended the 2010 Lewarde Colloquium. This centre is an absolute marvel in terms of its presentation of the life and hard times of coal miners and their communities. It is a living link with Zola's Germinal. It is well-managed, welcoming and not to be missed. For professional mining historians, students or family visitors, Lewarde is a treasure and a credit to all who continue to remind us of the debt the present owes to the past. 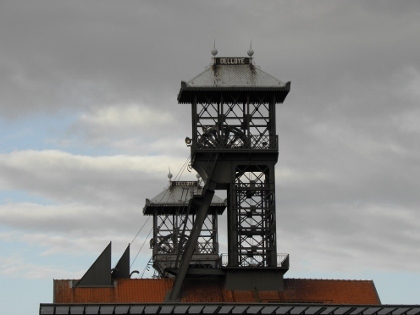 Modern Urban Planning: Criterion (iv): The living and evolving mining landscapes of the Nord-Pas de Calais Basin provide an eminent example of the large-scale development of coal mining in the 19th and 20th centuries, by large industrial companies and their considerable workforce. This is a space structured by urban planning, specific industrial structures and the physical vestiges of coal extraction (slag heaps and subsidence).